Just a heads up... they will be having a Holiday Sale from December 14, 2012 through January 2, 2013 where you'll get 20% off your registration, making it $44 instead of $55. Figured I'd post this up now so if anyone knows they'll be going, they can save the $11. For those who haven't gone before or have never heard of it, this is a very large and unique car show and swap meet. If you want to participate in everything, good luck. I'm yet to go and enjoy everything that goes on there. There is literally a lot to do on and off site. Test drive the new Fords, go crawling in a truck, burnout competitions, bikini contests, other off-site track events, etc. Plus, they close down historic downtown Carlisle for a night street party and parade with several hundred cars. This year, Team Shelby will be hosting a Grand National event at Carlisle. They'll also have special displays for the 20th anniversary of the SVT and the 50th anniversary of the 289. All this happens in three very, very fast days. Looks like the price of the parade is now $20 instead of $10! I should know around the end of the week what I'll be bringing to Carlisle, but I'm hoping to bring an SSP. I just registered and added the parade option. $20 is a big jump from last year! I looked up the price from last year. It was $15 for the parade, but $10 for a pre-register. I hope the $20 wasn't a pre-register discount! Ouch! I found out a while ago that the price spike is actually from the town of Carlisle, not Carlisle Events. Carlisle Events doesn't see any of that money. As happened last year, the Scranton, PA stop will be once again at Dunkin Donuts and the owner of the franchise will be giving us gift cards. There will be a deadline on getting a gift card just so I can give him a final count (May 29th). I like the smaller groups, but there is another group who is contemplating leaving on Thursday as opposed to Friday. If they leave Thursday, they said they will more than likely be joining us. There is going to be about 5-7 of them. Looks like the TWF tent is in the same location again. I'll be up on the hill with the Bronco's this year for Saturday. Not sure about Friday and Sunday I'll park down around the TWF tent. We could do tailgating... lol! Joe, thanks for pointing that out. 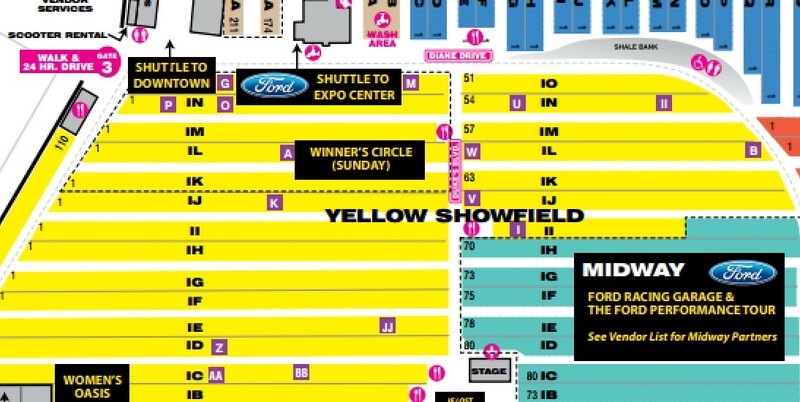 I have attached an image of the show field from that PDF. We are the "K". I have confirmed that once again we are in the middle of the "MUSTANG - 1987 - 1993 MUSTANG LX -STOCK ( EXC POLICE, GT, ET]" class. This year there is a new events management person so I didn't want to take any chances. For reference, if this is your first time attending, you will be entering through Gate 3. Unfortunately, I won't be able to make it this year. I have too much going on at home and I can't break away. Well, I hope to see you next year then! It looks like tomorrow will be an interesting day. I had planned on leaving in the early AM, allowing me to visit family in MA, but that might be delayed now. For those who don't know, I'll be towing my '84 Mustang L w/ 34K to put in the corral with my "actual" show vehicle, a 1996 MA State Police Bronco. Apparently at some point prior to auction, the wires for the tow package were clipped out. Just found that out today when I hooked it up for the first time. Looks like I'll be spending tomorrow AM playing with wires so I have lights and brakes on the trailer! Fun, fun! LOL! That stinks. I hope you got that worked out! Great to see you John, Mike and Joe!! Hope you all had a good trip home. Mike and I got home safe. For those of you who don't read the TWF Facebook page, I'll share that Amy won first place in our class with her 1993 Yellow Feature car and Mike P. won third place with his 1992. We had some really nice cars in our class and these two looked great. Yet another great Carlisle in the books! Already can't wait for next year! I just got home this morning at around 10:30am. It was one LONG drive home. 26.5 hours (including two cat naps and a few short rest areas to let the rain storms lighten) as opposed to the usual 14.5 hours. Come to find out, the left radial arm bushing is bad in the Bronco, so it caused it to sway left slightly when driving, but when under hard braking, it really wants to move left. The trailer and Mustang weight didn't help it any. Add the wet roads... ya, it was a fun drive. No deer meat for the ride home... lol! It seems like an unusual year at Carlisle. The majority of this group didn't bring the Feature cars and the majority of the SSP group didn't bring their SSP's either. Hopefully next year we can get a sea of yellow, white and red! I'm glad you made it home safe. That deer that crossed your path on the way down was quite lucky as were you. I'm sorry you didn't sell the '84. We'll definitely have to figure out a way to get more feature cars next year.